The VPA or UPI ID (UPI Address) is the key to BHIM UPI fund transfer system. It has replaced the need for bank account details. Whether it is BHIM App, Tez, Paytm or Phonepe, all UPI based apps use the UPI ID. UPI ID is also known as the Virtual Payment Address (VPA). This address makes the BHIM UPI unique. On the basis of UPI ID, the BHIM UPI is the most simple payment method. It is a mobile-based fund transfer application. UPI has many benefits over the card payment, IMPS and digital wallets. UPI ID is an address which identifies you in the UPI Payment system. This Address facilitates fund transfer without using the account number. Whereas money goes from one account to another. Normally upi apps use your mobile number to create the UPI ID. It can be Google Pay, Phonepe, or SBI Pay. It is slightly difficult to find out the UPI ID of Paytm. Some of the UPI Apps, show the UPI ID upfront on the first page. Notably, SBI Pay shows UPI ID on the first page. You can identify this address by the symbol of @. To enter into the profile section tap on your name or photo. In the SBI Pay, tap on the menu icon at the top left to reach the profile section. If you want to pay money to anyone without using the cash, then you need the bank account number of the payee. Along with the bank account number, you also require the IFSC code. In other words, the bank account number and IFSC code is the address to pay the money. But your bank account details can help the fraudsters. Using bank account details, the fraudsters try to cheat the gullible people. So it is always better if you can avoid exposing your bank account. The VPA or UPI ID fulfills this requirement. This address is linked to your mobile number and account number. In fact UPI ID is similar to the MMID. 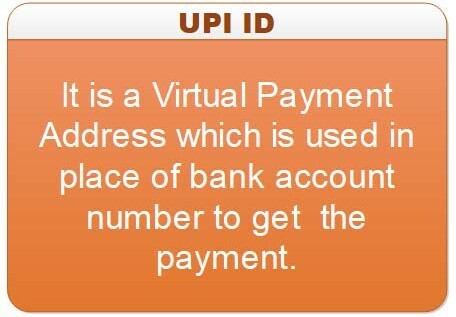 UPI ID or VPA is a Virtual payment address which is used in place of bank account details for the fund transfer. This address is unique to every user. It is very flexible and you can change it. Since it is not your actual payment address but act as the payment address (bank account details), It is called as the virtual payment address or VPA. The UPI ID resembles the email ID. For example, you can have a UPI ID as rishi21@axis or shruti@PNB or 98765__210@upi. Because of the UPI ID, the BHIM UPI easily hides the bank account details. The whole transaction of BHIM UPI takes place without the use of bank accounts. Only the NPCI knows to which account a VPA or UPI ID is linked. The NPCI itself does the transaction. The banks only act as the creditor and deductor. You do not give bank account number to receive money. It is easy to remember than the bank account number and IFSC. To be more secure, you can change the it whenever you suspect. You can get UPI ID of your choice. The VPA is a part of the BHIM UPI payment system. Therefore, you have to download the UPI App to get the virtual payment address. With the download, you have to link a bank account to the UPI app. The BHIM UPI app is linked to the bank account through the mobile number. Therefore, you should use the mobile number which is linked to the desired bank account. You must download the app on the same mobile which is linked to bank account. After the mobile verification, you have to go through another round of verification. It can be a grid, security answer or any other authentication. After the authentication, you can create a VPA or UPI ID for your given account. Like an email address, you have to give your choice of VPA and check for the availability. If the given Address is available, proceed. Otherwise, try another address. If your VPA is unique, you would get instant approval. You can use it immediately for getting money from another BHIM UPI app user. You can have many virtual payment addresses. However, not every UPI App gives this flexibility. For example in the tez app, you can’t create UPI ID yourself. You can change it whenever you wish. It is also not possible with the Tez. You can link many accounts with one VPA but you have to set an account as the default. At a time one VPA would be linked to only one account. You can’t choose the suffix of the VPA. It is fixed by the UPI App. It is the basic name. This term is used since UPI payment system is being used. BHIM SBI Pay, PhonePe, Pockets and BHIM Axis Pay use this term. The BHIM app started to use the term UPI ID instead of the VPA. Axis Pay also used this term. The Google Pay (Tez) uses UPI Address instead of VPA or UPI ID. Google Pay (Tez) – It has many Suffixes depends upon your bank. The main use of the virtual payment address is the fund transfer. To give money to anyone using the UPI method, you must know the VPA of the beneficiary. These are the steps of money transfer. Enter the beneficiary UPI ID, amount and remarks. Enter MPIN to authenticate the fund transfer. UPI provides a way to ask money from someone. Let us see the steps. enter the VPA or UPI ID of the person from whom you want money. If you have multiple accounts/virtual payment addresses, choose the address to which you want money. When the person approves your asking amount, you would get it.